Snacking is huge for me. It’s huge in the sense that I do it 2-3 times a day (which can really impact my health and body shape!) So if I want to not starve or not gain just tons of weight, then I need to have and eat healthy snacks. Healthy snacks don’t always come in boxes on the cracker aisle. In fact, I need to take the time to prepare and plan healthy snacks for myself or I’m going to end up eating empty carbs because it’s easy and frankly, I like the chip-y sound they make in my mouth. One of my recent favorite snacks is Cinnamon Spice Pecans. This is a Taste of Home recipe and I love it! 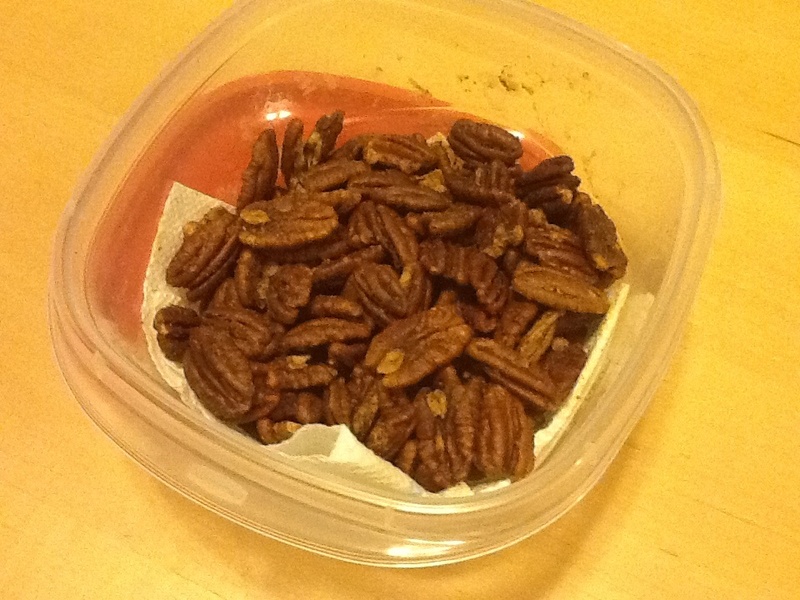 I’ve done it with pecans and mixed nuts and they all taste great … but the pecans are phenomenal!!! I love them. I LOVE that this recipe doesn’t have sugar in it either. wa-hoo! They aren’t much to look at … they just look like regular pecans … but they are spectacular!!!! You have to make them! The recipe is below. *Sorry for they yellow-y photo … I just snapped it with my iPad right quick and that camera isn’t very good! In a large bowl, combine the butter, cinnamon, salt and cayenne. Stir in pecans until evenly coated. Transfer to an ungreased 15-in. x 10-in. x 1-in. baking pan. Bake at 350° for 15-18 minutes or until pecans are toasted, stirring every 5 minutes. Yield: 4 cups.